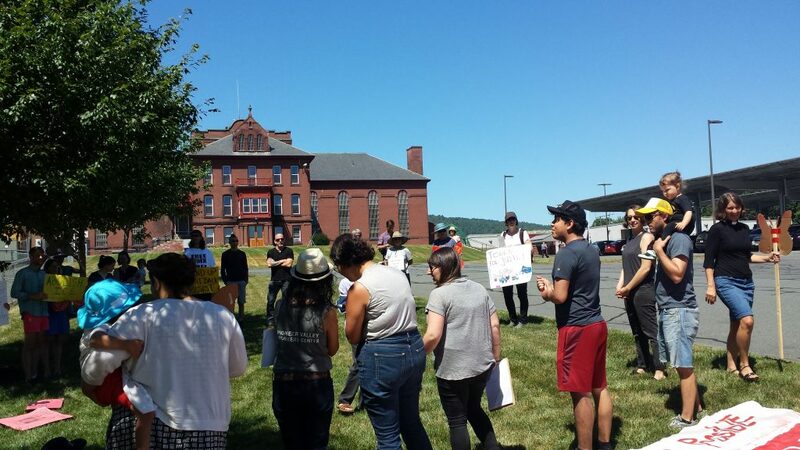 Two days after the state Legislature removed a set of provisions in its budget that would have protected immigrants in Massachusetts, a group of activists met in front of an immigrant detainment center in Greenfield to sing songs and demand an end to cruel treatment of immigrant families. More than 50 people participated in the action, which took place at 11 a.m. Friday, July 20, at the Franklin County Sheriff’s Office and jail building at 160 Elm St. in Greenfield. Some of the participants were small children brought by their parents or caregivers. Ali Pinschmidt of Haydenville brought her two-and-a-half year old daughter Hazel to the event. “We’re here to show solidarity for all of the kids and the parents that are locked up and are separated from each other,” she said, adding that she had learned about the action through her neighbor. With emotion in her voice, Pinschmidt said that hearing about kids being separated from their parents moved her to get involved. “I think everyone who is a parent gets emotional about that,” she said. She said that domestic law and foreign policy can make it difficult for families seeking a better life in the United States to get documented. She said that people are being forced to leave the country that has been their home for almost all of their lives and is all they know. Eduardo Samaniego, one of the organizers of the event, and also an undocumented immigrant, said part of what the activists hoped to do was bring attention to the fact that there is an Immigration Customs and Enforcement detention center in Greenfield. “This is literally right downtown,” he said. He said he believed that ICE should be eliminated. Samaniego said he was disappointed and disillusioned due to the decision by the state Legislature to remove a handful of state budget provisions that would have protected immigrants. Those included disallowing law enforcement from asking questions about immigration status on the street, disallowing collaboration with local law enforcement and federal immigration officials, forbidding the creation of registries of any kind based on immigration status or nationality, and also requiring police to tell immigrants they have the right to have a lawyer during any legal process. “We do not want to weaponize this information in any way, shape, or form,” he said of immigrant or nation-based registries. As more people gathered, two uniformed officers approached the crowd. Organizer Rose Bookbinder told the officers the protest would be a peaceful protest and be completed by noon, and the officers returned to the Sheriff’s Office and jail building. 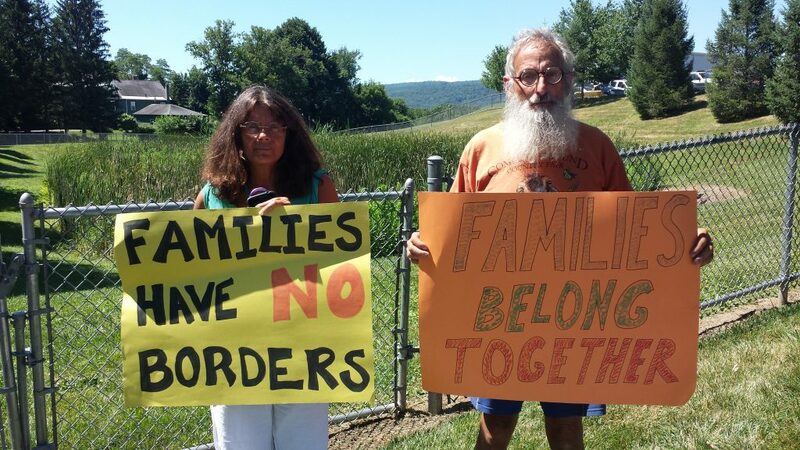 Bookbinder led a call and response among participants, who chanted, “We are here today with our babies and families because we could not sit back and do nothing.” Participants said detaining entire families was not a solution to families being separated at the border and that thousands of families had already been ripped apart. Among the crowd was state Senate candidate Chelsea Kline, who is the only candidate on the ballot for the Franklin, Hampshire, and Worcester State Senate seat recently held by Stan Rosenberg. Kline is being opposed by four write-in candidates, none of whom were at the event. Kline said stronger action was needed to protect immigrants, families, and children. She said she wanted people who are being detained, or who are in danger of being detained, to know that there are people out there willing to show up and use their voices to protect them.